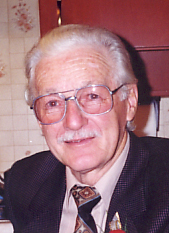 Peacefully Dad passed away at the age of 84 years at the Souris Personal Care Home. He was survived by daughter Deborah Cann, son-in-law Dwight, brother Walter (Audrey), sister Joy (Gene) and nieces and nephews. He was predeceased by wife Mary. Dad was born in Pine Falls and had a natural musical talent. From entertaining the barnyard chickens with two sticks for a fiddle at the age of four to having his own band and entertaining many people throughout the years at various events — this is what he loved to do. Farm life was not Dad’s calling, so he moved to Winnipeg and married Mary Kolpak in 1953 and they had just celebrated 61 years of marriage before Mom passed away in November 2014. Dad worked at Canadian Linen Supply throughout most of his working life, beginning as a driver and retiring as a retention manager, all the while performing music in his spare time. Dad could play just about any instrument he picked up, but his two favorites were the saxophone and the fiddle. When Sad was in his twenties his Thunder River Boys band cut an album, and when he was in his seventies he made a music CD with his Uncle John. Sadly due to declining health Dad had to give up performing with the Cavaliers, a band he played with for many years, but his friendship with some of his band members continued to the end. Dad’s illness resulted in his being wheelchair bound the last few years of his life, but in 2013 with his wife, daughter and son-in-law he moved to Souris Manitoba, living in the Personal Care Home where he spent lots of time with family and friends as well as attending the home’s various functions. Thank you to Dr. Ziada, and special mention to the staff of the Souris Personal Care Home. Our family will always be grateful for their exemplary care, friendliness and compassion. Dad’s wishes for cremation have taken place and burial at Brookside Cemetery in Winnipeg to follow at a later date. Dad, Thank you for wonderful memories to fill our empty hearts.